Giving a go ahead to the Art of Living (AoL) foundation to hold the World Culture Festival, the national green tribunal (NGT) has slapped a fine of Rs 5 crore on the Art of Living (AoL) foundation for the construction activities on the Yamuna river bed. The tribunal has asked AoL foundation to deposit the environmental compensation before the start of the festival on March 11. Besides, Delhi Development Authority (DDA) and Delhi Pollution Control Board (DPCC) have also been fined with Rs 5lakh and Rs 1 lakh, respectively, for failing to discharge their statutory functions. Manoj Mishra, convenor, Yamuna Jiye Abhiyaan, who had filed the petition before NGT, says that all the contentions of environmental activist have been proved right. “The government of India and government of Delhi have been indicted,” he says. NGT has directed the principal committee to submit report on restoration of flood plains in four weeks’ time. Moreover, NGT has directed DDA to not allow any such events on Yamuna flood plains in future. The AoL foundation has been asked to give undertaking by Thursday that enzymes will not be released into Yamuna and no further degradation of environment will happen. “Let no one be under the impression that they can destroy flood plains for Rs 5 crore. It is a token fine. The final fine amount will be much higher once the principal committee submits its report,” says Mishra. He added that the court told the petitioner i.e., Yamuna Jiye Abhiyaan that they should have come sooner. “The order is a matter of introspection for both the state and central governments. They should avoid participation in this culture of violation,” says Mishra. 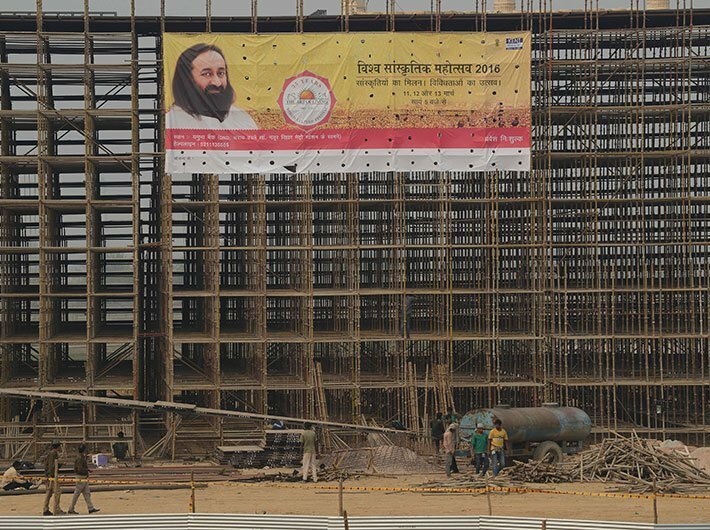 Art of Living counsel told NGT that total cost for creating venue of this event is 15.63 crore, in addition to 10 crore for decoration. The court cited its inability to issue prohibitory orders asby the time the petitioner had approached the green tribunal, majority of the construction had taken place and much damage was done to the river plains. Art of Living foundation had not disclosed the extent of the program to the authorities and the foundation is liable to pay compensation for that. Ministry of environment, forest and climate change should have intervened as the area covered for the event is more than 50 hectares. AoL had not obtained permission as yet from the police department, fire department and from the ministry of water resources, river development and ganga rejuvenation. It has directed AoL to seek all requisite permissions.